We’ve been screaming about you all getting rid of your 600 MHz wireless transmitter system since Sound Advice – and now the window is closing. Read on to discover if you can still get out of the burning building Verizon and friends have left us, or if you’re burning down with your-now-illegal investment in wireless. Sure. You’ve known. 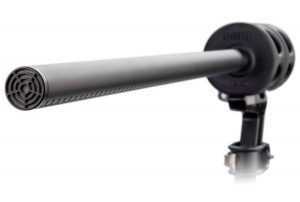 You’ve got 5 channels of 600 MHz in Sennheiser, Shure, Audio-Technica or whoever. You knew that using it would eventually have the accountants with guns show up at your door. You’ve been lucky. They haven’t yet. But they will. Guaranteed. So it’s time to stop rolling the dice on your future just to save a couple of bucks, and get rid of those old systems. Ideally you’d want to trade them in to the manufacturer who sold them to you – make them eat the loss in money. But your options are getting few and far between…and you’re going to need to act fast if you’re going to take advantage of any of the incentives available. You’ve got until 3/31/19 to switch out your ATs! Their “Trade In On Your Terms” program lives until March 31st, 2018 – which is the correct information as opposed to what B&H put out in its penultimate catalog. You do not have until 2020 as they suggest. Do this program right, and you can buy a new system, and send the old one back. You’ll be tempted to continue using the old one – but don’t. Once you send back the old system, you’ll get a rebate a few weeks later. Make sure you get a qualified single or dual channel system. It’s pretty easy. You verify that you’ve got a 600 MHz system from AT, send in the required documentation with your old system, and you’re good. We’re a little nervous about what’s qualified and what’s not – so be sure to do your homework. All-in-all it’s not really a “trade-in” system, it’s a “buy another one of our systems, and we’ll give you a break” which in our book is really just another ploy to get you to part with more of your money. Learn more about it – and make it happen soon – here! Shure’s trade-in program has expired. It did so on Halloween of 2018. Sorry. You’re out of luck here. Boo. Sennheiser will let you turn in anyone’s kit for a new Sennheiser piece of kit. 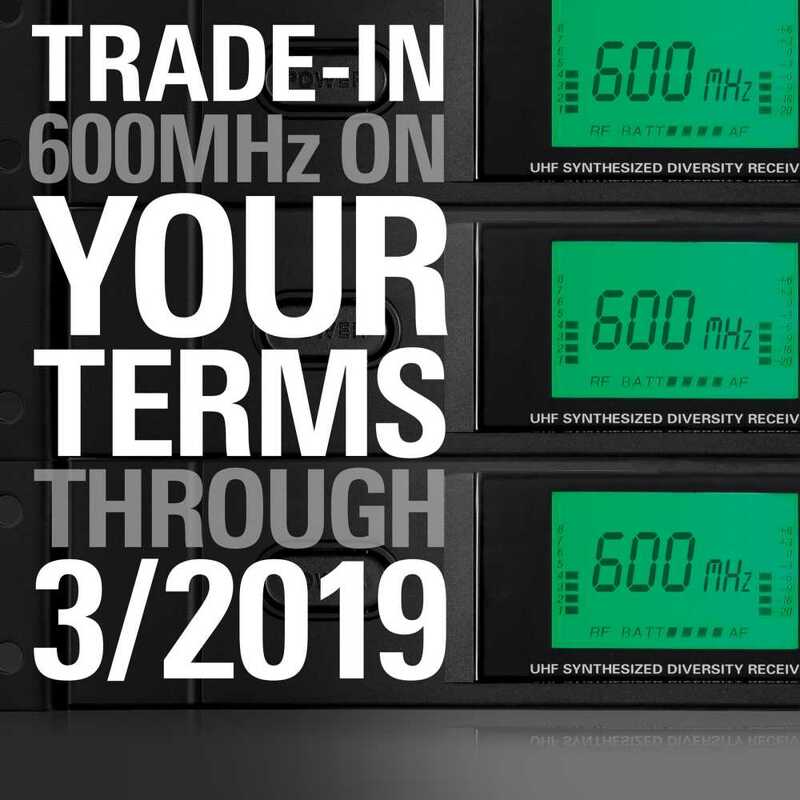 Sennheiser’s rebate program is about to expire: March 31st 2019. If you’ve got an illegal Sennheiser, go go go!! Just to be clear, however, if your operating frequency is below 608 MHz (as many Sennheiser products are), you’re actually NOT BREAKING THE LAW. Keep your Kit! Use it with abandon! But if it’s above 608, you’ve gotta stop using it. Like Audio-Technica, it’s not really a trade-in program as much as it’s a “buy another one for max price and we’ll help you a little.” Granted, it’s better than nothing, but all of us had hoped for a little more generosity on the part of these companies. 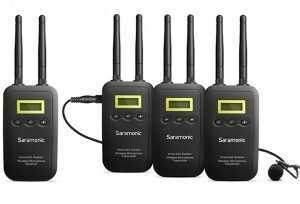 But here’s the thing with Sennheiser, they’ll take any wireless unit from ANY MANUFACTURER that is in the 600 MHz. Which means all of you folks with Shure still have a few weeks left! Of course, it means you’ve got to purchase a Sennheiser unit, but at least you’re not out of luck completely. If you pay close attention to the instructions you’ll see a rebate check around 8 weeks in. Again, this expires 3/31/19. Hurry! Look here to begin your process of Sennheiser trade-ins! Honestly, this is the worst thing we’ve seen in a while: consumer electronics bashing professional audio in the teeth with no recourse and no good resolution. If you’ve been stuck in front of the bus on this one, feel free to put your woes below on this article. We all feel your pain. Set Your Camera Op Free! Saramonic Dialog Wind-Shredding Shotgun SHOOTOUT!